FAQ: How do I create search alerts in EBSCO? EBSCO databases allow users to set up searches as alerts which can email you with any new results. Select "Sign In" option in the top navigation bar of EBSCO databases. Run a search and view your search results. Click the "Share" link, and select "E-mail Alert" from the resulting pop-up menu. The Create Alert window appears over the result list. If you have not signed in to My EBSCOhost, you will be prompted to do so. Set your alert parameters and click "Save Alert". You can also use the "Advanced Settings" link at the bottom of the "Create Alert" screen to set more detailed parameters of the search alert. I saved some articles to a folder but now I can't find them? How do I save searches in EBSCO? 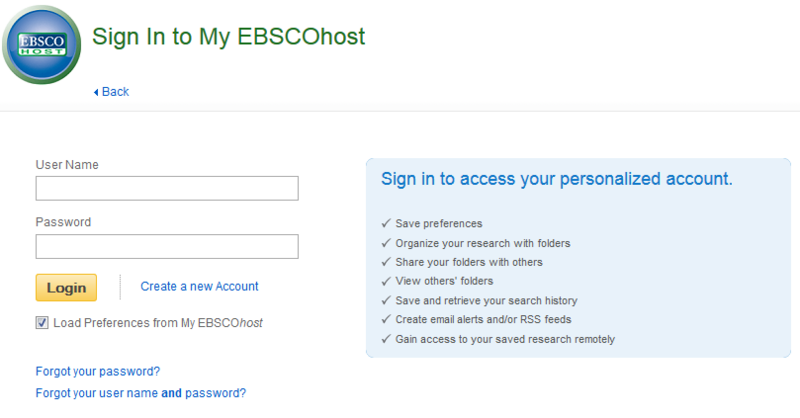 What is the EBSCO username and password?